The ACMG Training and Assessment program completed the Apprentice Ski Guide exam in the Lake Louise area from April 5th-13th. 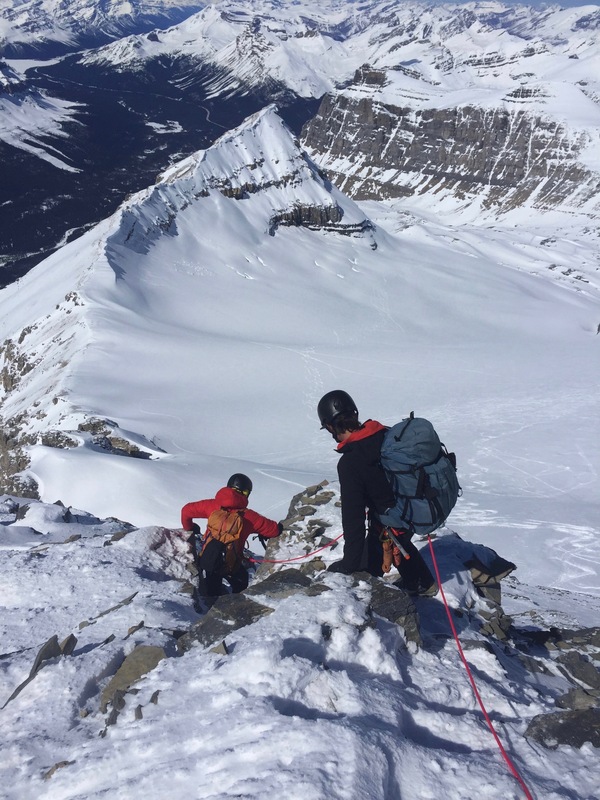 Terrain Visited: Groups skied trips on the Wapta Icefield in between Peyto Lake and the Vulture Glacier, as well as Sub Observation Peak, Cirque Peak, Mt Hector, Pumpkin Traverse, Mt. Field, Popes Peak, and Mt. Niblock. We travelled in between 3200m and 1600m in elevation on all aspects. Ski Conditions: We found good to excellent ski quality on most aspects above 2700m, with unconsolidated new storm snow totalling an average of 30cm as of mid-day Thursday. Solar aspects held a supportive crust which carried skier weight to 1600m until early afternoon. There were isolated areas of wind effect in the new snow, mostly above 3000m. As previously mentioned, there is variable snow distribution on the glaciers, ranging from areas with 60cm (Hector Glacier) to over 300cm (most of the Wapta Icefield). Crevasse sags were becoming more evident in good visibility, despite the additional snowfall. Avalanche Hazard: Observations in the areas we visited were limited to isolated natural and skier triggered avalanches up to size 1.5 in steep terrain, where a wind slab was present. Deposits of up to size 2.0 were noted in solar terrain at all elevations from the previous weeks' hot temperatures. Some isolated natural activity was also noted on solar aspects in the alpine elevations where the new snow (15cm-30cm) was overlying the previous sun-crust. Of note, 'whumphing' was observed on high elevation North and East aspects of the Wapta Icefield. Investigations revealed a buried layer of surface hoar up to 6mm underneath the recent 30cm of snow accumulation. Ski cutting in small convex terrain where this existed did not produce any avalanches; however, the surface snow lacked cohesion at that time. The March 7th persistent weak layer remains roughly 50cm - 60cm from the surface; it was in the back of our minds despite the lack of recent avalanche observations involving this layer. Overall a great time to be skiing in the Rockies with nice weather, fast valley bottom travel, and excellent ski quality due to new snow at high elevations. Darek Glowacki on behalf of the Apprentice Ski Guide Exam candidates.